Ulster Unionist peer Lord Kilclooney has indicated he would be prepared to back an external candidate to lead the party after next April. The former MP John Taylor made his comments in a statement which ruled out any possibility of him standing as permanent leader of the party. He mentioned Colonel Tim Collins as one of a number of possible candidates. But Colonel Collins ruled himself out, saying he was "not qualified to undertake such a momentous position". "I have no experience of politics," the former Royal Irish Regiment commander said. "I have a life in the real world and I would have to be acquainted with issues affecting ordinary people before I could be an effective member of a local assembly or indeed parliament." 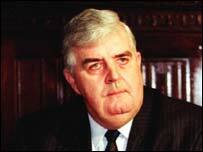 Lord Kilclooney said the leadership names suggested so far did not reflect the "radical new approach the party needs". Former leader David Trimble resigned his leadership after the party lost all but one of its Westminster seats in the May election. The Ulster Unionist Council meets on 24 June to elect his successor. "Even now there is absolutely no evidence that the UUP realises what is necessary to regain the confidence and support of those who have transferred their support to the DUP or who, in their thousands, now simply refuse to vote," Lord Kilclooney said. He said the party needed a leader "who is not identified with the past, and who has the imagination to advance a radical new approach for the party". "That is why I suggested an interim leadership until next April so that the UUP could prepare itself for a totally new leadership; for example Colonel Tim Collins and this is only one of a number of possibilities." He said he was "saddened" that the UUP "seems to stumble from one reversal to another and shows no sign of bringing this decline to a halt".